I've been doing a bit of reading on this issue and just wanted to gain some knowledge from the hive mind. So initially after the swap everything was great but 10,000 miles later I'm getting this irritating hesitation when accelerating from a dead stop. If I hammer on it, it picks up and goes no issue at all. However if I ease into the throttle like I normally would it hesitates for a second and then starts to accelerate normally. My understanding is this a throttle/fuel issue 90% of the time. I'm starting with the easy stuff, Throttle position sensor and temp sensor for the ECU. This leads me to the first question. I've got 3 temp sensors on the engine, one on the intake, one at the front of the head drivers side, and one at the back of the head passenger side. I know the one on the rear passenger side is for the gauge. Which one of the other 2 is for the ECU? If both of these get me nowhere my next guess is fuel pump? Fuel filter was just done, otherwise I would start there. Fuel injectors have a great pattern and are fairly new. I'll have to pick up a fuel pressure tester and see what I'm getting, if I remember correctly it should be 9-13 psi? The pump has never been changed since '86. The truck has always suffered from long cranking times to get it fire up after it's sat for a while I'm fairly sure this is due to the drainback valve in the pump failing. Anyone have any thoughts or experience with this hesitation issue? I'd definitely look at fuel pressure. I put an inline gauge to keep tabs on mine. 13lbs is where mine runs. I have an issue with mine too right now. Runs fine but when you drive for say 30 minutes and park and come back? It's hell to get it started. Acts like it's flooding. Once you do get it to start, it runs fine again. I'm thinking I've got an injector that is leaking down when stopped into the TBI. Been too busy to diagnose. Good luck. Fuel pressure, and dirty injectors are my first thoughts as well. The fuel spec. on the 2.8 TBI is 9-15 PSI, but I'd want at least 11. Also, it should flow at least a pint in 15 seconds. Test this by disconnecting the line coming into the filter and route that into a clean empty container that can hold at least a quart, maybe two. Jumper the fuel pump relay to run the pump for 15 seconds, and measure what comes out. It should come out of the fuel line at a pretty good rate, and have no problem passing the pint in 15 seconds check. If it struggles to meet that spec, replace the fuel pump. You can check the injectors if you have an ignition timing light. Connect the timing light to any spark plug (or the coil wire), and shine the timing light down the throttle body itself while the engine is running at idle, and rev'd a bit. The ECM fires the injectors when the coil fires, so the timing light will "freeze" the spray pattern in the light. The spray from the injectors should look like a "hollow cone". If there is any dripping or weak spray, the fuel pressure is too low or the fuel injectors are dirty. I've had good success sending TBI injectors off to be cleaned, and a rebuild kit for the TBI itself is pretty cheap and relatively easy to do (it's mostly just gaskets, and a new fuel pressure regulator diaphragm). Inspect the rubber lines connecting the steel fuel lines to the return line at the frame, the fuel filter, and at the fuel tank. If they're collapsing, it will cause problems as well. That’s some good advice about the timing light. I will have to try that myself! Thanks for the reply and suggestions! I tried your trick checking the injector spray pattern with a timing light just a minute ago. There is a slight drip coming from both of them. I just ordered a new bosch in tank fuel pump and strainer to replace the 30+ year old one. I recently rebuilt the Throttle body and installed a new pressure regulator. While I was at it I double checked the timing (used proper procedure) and it was set perfect at 10*. However I did notice when I applied throttle while checking the timing the timing mark jumped from 10* way down to 2*?? I've never actually blipped the throttle while checking timing but should it not advance? in my case it's retarding when the throttle is applied. When I change the fuel pump I'll also inspect the rubber lines while the bed is off. Edit** just did a quick google and it appears the timing is advanced at idle and then under part throttle retards? Installed my new bosch fuel pump last week and it completely fixed the issue. Drip from the fuel injectors is gone and the hesitation is totally gone. I opted to just replace the pump and not the whole in tank unit, cost me $56. Wish I had done this sooner as I'm sure I lost well over that in fuel economy. Thanks again for the advice/suggestions gentlemen. Interesting. Wondering if my problems are stemming from the fuel pump too. My truck has an aftermarket externally mounted Holley pump on it since it was originally a carbureted truck. I want to replace the old tank anyway....Perhaps I need to go full stock on fuel delivery. It’s the only thing I can think of that would explain its behavior. Glad you got yours fixed!! 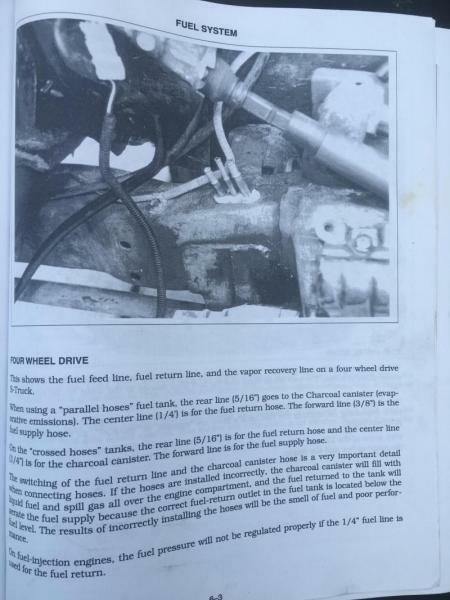 This post has me analyzing the problems with my truck. 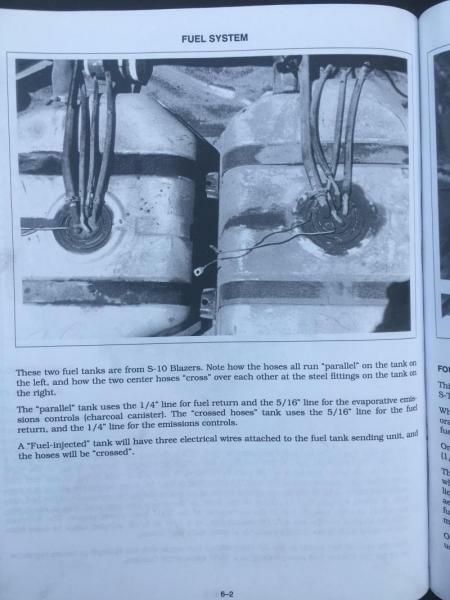 I forgot about my JTR V8 conversion manual I had where it told me about the differences in the tanks and the parallel and crossover tanks. I never changed any of this on my 84 when I converted to EFI. Guessing I will need to swap to an in tank pump and route the hoses correctly. My truck reeks of gas at times and it also runs like crap after I park it or idle it for more than 30 minutes. Betting this is my issue. Another image. This explains in more detail. I converted my 1982 2.8 truck to TBI in 1995. I didn't know about the difference between the carb. and EFI fuel sending units, and accidentally used the vapor line for return. In my case it pushed fuel into the canister so it was easy to notice. Swapped the hoses and it worked fine for over 19 years after that. If the hoses aren't swapped, you're returning fuel to the top of the tank, where is most likely just empties/sprays on top of the fuel rather than returning into liquid at the bottom of the tank. That churns the fuel quite a bit, so it wouldn't surprise me if you could smell it. My truck came with a 13 gallon tank. I recently replaced my fuel tank and in-tank assembly when I swapped in a 5.3 L33. I couldn't find a 13 gallon EFI tank and matching sending unit, so I ended up installing a replacement 20 gallon tank and matching in-tank unit. I re-used the stock mounting straps. Just as a note of interest, did you know that an aux tank was available for your truck? Mounted on the right side, approx 20 gallons. I've never seen an S10 with dual tanks. Exhaust routing on a dual tank S10 must be interesting On mine I'm not sure how I would route a pipe on the driver's side around the tank and still have space between the exhaust and the driveshaft. Having a fuel tank on each side would definitely present a challenge.